ENGEL at the DKT 2018: NCC West, Hall 12, Stand 317 - LAKARA d.o.o. At the German Rubber Conference DKT 2018 in Nuremberg, Germany, from Ju-ly 2 to 5, ENGEL will present three applications to demonstrate its high exper-tise in systems solutions for elastomer processing. 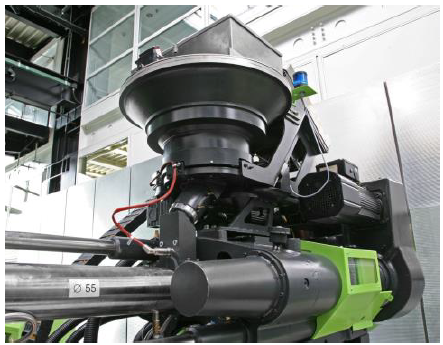 On show: horizontal, verti-cal, hydraulic and all-electric injection moulding machines that underline how quality and efficiency potentials can be tapped effectively with tailor-made manufacturing concepts. Producing flat seals and O-rings competitively – that is the strength of the ENGEL flexseal. At the DKT, the particularly compact servohydraulic injection moulding machine will show that it combines top efficiency with performance and precision also in multi-component pro-cesses using elastomers and thermoplastics. In an ENGEL flexseal 500/300 with a clamping force of 3000 kN, PBT inserts will be sheathed in solid silicone (HTV) and the two-component membranes tested for quality inline immediately after production with the help of a vision control system. ENGEL supplies the complete integrated systems solution necessary for this process, partnering with the material supplier Mesgo (Gorlago, Italy), the mould makers ORP Stampi (Viadanica, Italy) and Giasini (Grassobbio, Italy) as well as Proplast Plastic Innova-tion Pole (Rivalta Scrivia, Italy), who are responsible for the CAD design. An ENGEL easix articulated robot equipped with an anyfeeder from Asyril (Villaz-St-Pierre, Switzerland) sees to parts handling. If ENGEL supplies both the injection moulding machine and the robot, the robot control unit is fully integrated into the machine’s CC300 control unit. In the integrated version, the machine and robot have a common control logic and the manufacturing cell can be controlled as a whole from the injection moulding machine’s operating panel. This reduces the complexity immensely. Experience with a linear robot already suffic-es to commission and operate the articulated robot safely. A further advantage is that the manufacturing cell is planned right from the start taking the robot’s interference areas into account, resulting in especially compact overall solutions. The flexseal injection moulding machine was adapted specifically to the requirements of manufacturers of O-rings and flat seals. It is suitable for all standard rubber mixtures and silicones and, thanks to the horizontal machine concept with screw injection unit, ensures very high manufacturing precision with the small to mid-sized shot volumes these applica-tions require. The flexseal enables fully automatic processing with conventional brushing devices. The series is equipped by default with the ENGEL servohydraulic ecodrive which, due to the longer heating times, pays off particularly in processing of elastomers. With ecodrive, the motors are only active when the machine is moving. During the heating phases, however, the motors stand still and do not use any energy. Liquid silicone rubber (LSR) continues to gain importance worldwide. One driving force be-hind this is medical technology. To combine maximum precision with maximum efficiency and maximum cleanliness, all-electric injection moulding machines are used. During the DKT, ENGEL will manufacture seals for respiratory masks in an all-electric ENGEL e-mac 170/100 with a clamping force of 1000 kN and integrated ENGEL viper 12 linear robot. With its particularly compact footprint, the e-mac injection moulding machine optimally meets the growing demand for increased output per unit area. ENGEL will implement this exhibit together with its partner Elmet (Oftering, Austria), who supplies the 4-cavity mould as well as the metering equipment of the type TOP 5000 P. As system supplier, ENGEL integrates all peripheral LSR processes in the e-mac’s CC300 con-trol unit so that the complete process can be set and controlled from the operating panel. For this application, the LSR material will be provided by Dow (Horgon, Switzerland). A reliable, high-precision injection moulding machine is prerequisite for the manufacture of demanding liquid silicone rubber products that are low in flash and do not require rework. The e-mac combines these properties with speed, energy efficiency and flexibility. To produce a constant high quality even in varying ambient conditions and fluctuations in the raw material, iQ weight control is used. The intelligent assistance system from ENGEL’s in-ject 4.0 series adapts the injection profile as well as the switchover point and the holding pressure profile to the respective conditions individually for every shot, thereby eliminating external influences even before a single reject is produced. 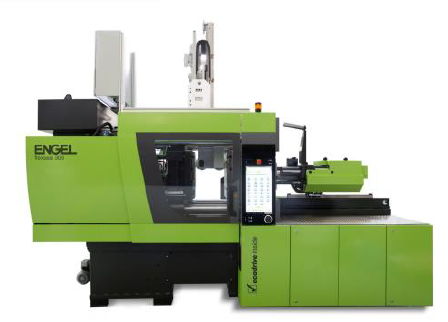 An ENGEL elast 2700/400 V vertical machine will represent the company’s broad spectrum of hydraulic injection moulding machines for processing various types of rubber and silicone as well as TPE in Nuremberg. During the four days of the event, ENGEL will use the ma-chine to produce frisbees for dogs from an EPDM rubber provided by Mesgo (Gorlago, Italy). Thanks to their modular design, the ENGEL elast V vertical machines can be adapted opti-mally to a particular application. Vertical machines are often used when manual work steps are necessary. The low operating height of the ENGEL elast V ensures particularly ergonom-ic work. The standard elast 400 V with a clamping force of 4000 kN is equipped with the en-ergy-saving servohydraulic ecodrive. The ENGEL roto feeder offers continuous, bubble-free and constant-pressure material feeding in the processing of solid silicone. Compact construction, high output: the all-electric ENGEL e-mac is used, among others, to manufac-ture seals for respiratory masks of liquid silicone rubber. Frisbee for the dog: the red disc will be produced from EPDM in an ENGEL elast 400 V during the DKT. ENGEL is one of the global leaders in the manufacture of plastics processing machines. Today, the ENGEL Group offers a full range of technology modules for plastics processing as a single source supplier: injection moulding machines for thermoplastics and elastomers together with automation, with individual components also being competitive and successful in the market. With nine production plants in Europe, North America and Asia (China and Korea), and subsidiaries and representatives in more than 85 countries, ENGEL offers its customers the excellent global support they need to com-pete and succeed with new technologies and leading-edge production systems.